Christopher appeared on NPR’s From the Top with Host Christopher O’Riley, Show 300, recorded in Boston, MA, on February 7, 2015. 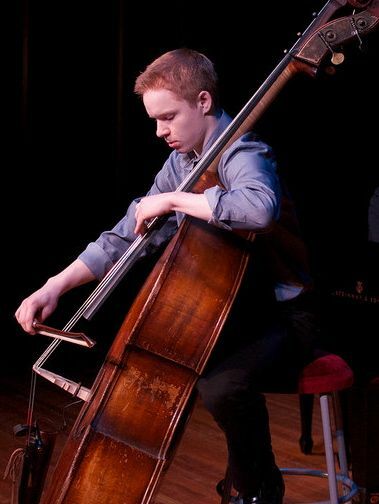 Christopher Laven (double bass), 15, is from Wayland, Massachusetts, where he attends Wayland High School. He studies double bass with Susan Hagen of the Boston Pops Esplanade Orchestra. Christopher is a member to the Boston Youth Symphony Orchestra, the Rivers Jazz Ensemble, the Wayland High School Jazz Ensemble, the Wayland High School Honors Sinfonia, and the Massachusetts All-State Orchestra. He has attended the Boston University Tanglewood Institute (BUTI) Young Artist Orchestra program and the BUTI bass workshop. Outside of music, Christopher plays basketball and is a second-degree black belt in Tae Kwon Do.